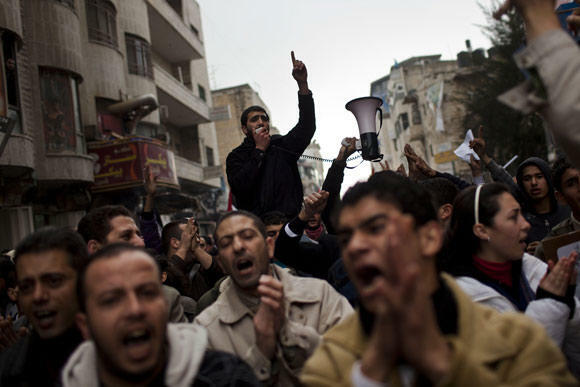 With the Egyptian uprising now in its thirteenth day, neighboring Israel has been in a state of unease. After Egypt closed the Rafah crossing, there were concerns that traffic, especially medical vehicles, wouldn’t be able to pass for a while. Gazans have also started to worry that there will be fuel shortages due to difficulties for Egyptian smugglers getting through, and Prime Minister Benjamin Netanyahu, after allowing Egypt to send 800 troops to the Sinai Peninsula in fear that things could spillover, watches in disbelief as an old ally is delivered a revolution at his doorstep. In front of the Egyptian Embassy in Tel Aviv, a week after the uprising had started, David Sheen at Mondoweiss videotaped two organized anti-Mubarak protests while he interviewed bystanders who watched from a distance. Alienated and angered, they listened to the Palestinian-Israeli crowd chant “Raise your voices, Arab people are not afraid!” It was the beginning of what was yet to come. Despite Hamas repositioning with anti-Mubarak rallies, a Facebook group calling themselves “The Revolution of Honor—Gaza,” which grew to 12,000 “likes” in a matter of days after its launch, asked Palestinians to join them in “a day of rage” in protest to Hamas. But its motives are questionable since it has close ties with Fatah, an adversary to Hamas. Elsewhere in the region, fears of protests continued to spread, including in Jerusalem, where police forces were warning people not to protest and only allowing Israeli men over the age of 50 or older and women of all ages to attend Friday prayer, while barring all Palestinians from Al-Aqsa Mosque. On Wednesday, in response to pro-Mubarak demonstrations at Ramallah, which were reported to have been orchestrated by the Palestinian Authority (PA), more than 100 anti-Mubarak protesters showed up at Manara Square only to be beaten and arrested by PA policemen in plainclothes. In the West Bank similar protests were violently stopped by the PA who later released a statement saying that all “unlicensed gatherings” would be illegal and dealt with in the same manner. Nonetheless, on Friday, there were still demonstrations in Ramallah (arrest video), along with Bethlehem and Bil’in. The running theme here is: pro-Mubarak gatherings are allowed without disruption, while anti-Mubarak gatherings are prohibited and shutdown. So what gives? This should come as no surprise, since the president of the PA, Mahmound Abbas, has close relations with the Egyptian dictator Mubarak, and supports the blockade on Gaza that has put pressure on Hamas while collectively punishing the Gazans. And after Al Jazeera recently published 1600 pages of documents called “The Palestinian Papers,” confirming that the PA and Fatah have been making backdoor dealings with the Israeli government, it gives Palestinians more of a reason to distrust them. The Palestinian government, sensing that unrest in Egypt could catch on, and knowing that Palestinians are no strangers to uprisings (intifadas) and nonviolent protests, is having elections “as soon as possible,” which haven’t happened since 2006.